Not all stories remain popular and relevant 100 years after they're published, so when a tale comes along that beats the odds you know it's something special. 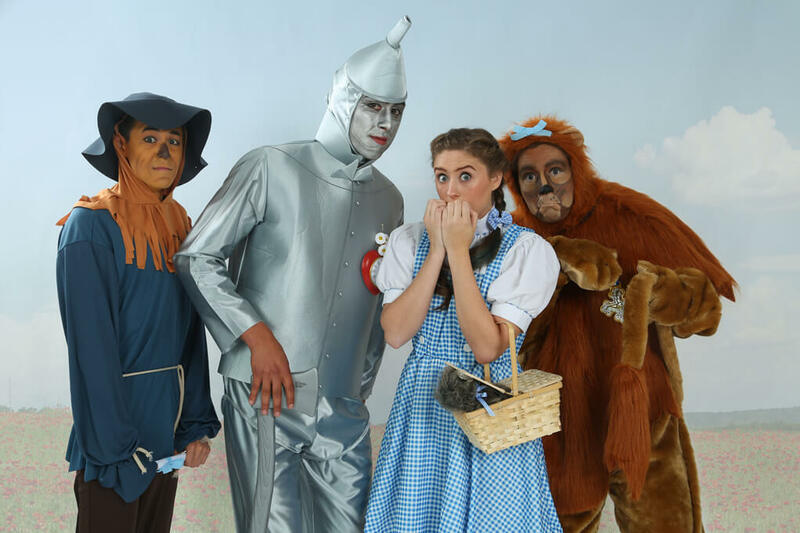 Whether you've read L. Frank Baum's novel The Wonderful Wizard of Oz or have seen the famous 1939 film, you are no doubt familiar with the iconic characters and the whimsical adventure they took us on. 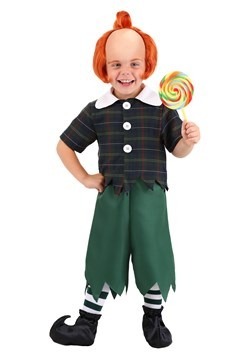 This tale continues to entertain and delight decades later and has been the inspiration for fun costumes for generations. 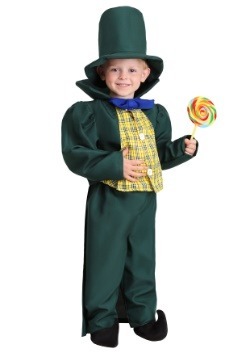 Wizard of Oz costumes are no less popular today than they were years ago. 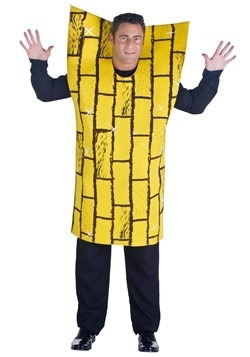 People still want to enjoy the thrill of walking down their own street while pretending it is the yellow brick road! 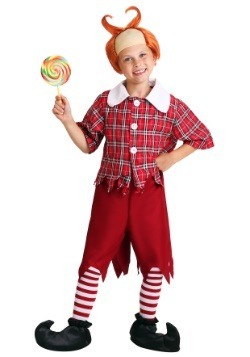 When you dress up as Dorothy, the Wicked Witch, the Scarecrow or any of the many other characters you can do just that. 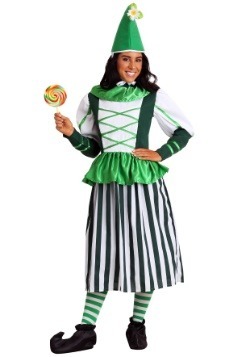 Get ready to enjoy what life is like somewhere over the rainbow! You've come to the right spot! 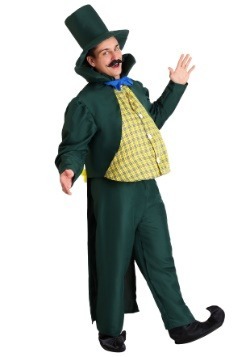 We have Wonderful Wizard of Oz costumes for adults to help you remember the magic. 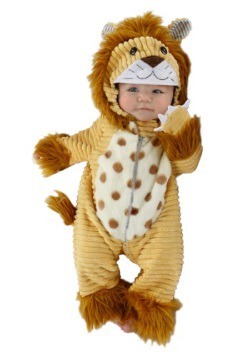 You could also dress up your child. 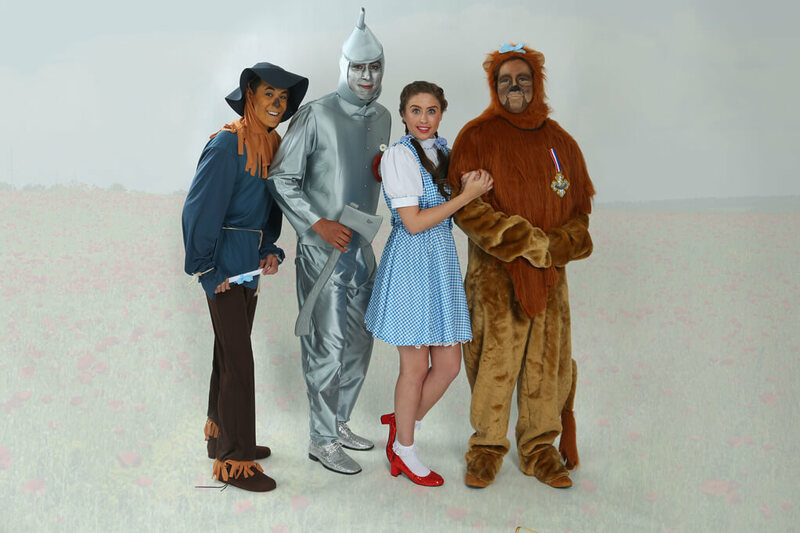 We have the Wonderful Wizard of Oz Halloween costumes for all the characters including the Tin man, the Cowardly Lion, the Scarecrow, and of course Dorothy. MGM's 1939 version of The Wizard of Oz brought L. Frank Baum's classic fairytale to life in a way that its predecessors never could – in amazing Technicolor! 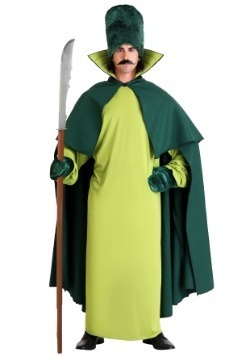 So naturally HalloweenCostumes.com worked directly with the Wizard himself to bring your family the best in Emerald City fashions. 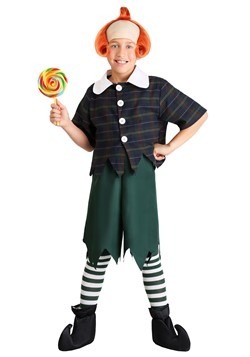 Now you can relive generations of the film's favorite adventures, like: The celebration in Munchkinland, the release of the flying monkeys, the rescue of Dorothy, visiting the castle of the witch, and finally reaching the palace of Oz – all in authentic character! 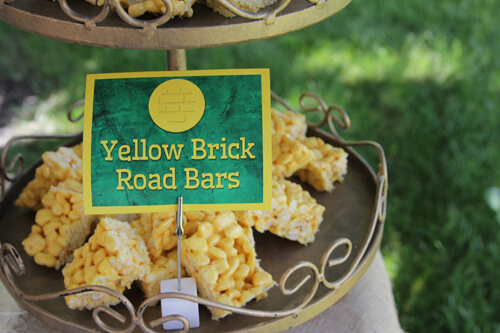 Let's start at the beginning ... how do you want to follow the yellow brick road? 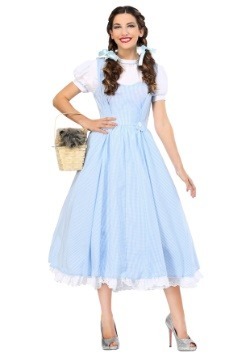 Are you a free spirit with a loyal uprising like Dorothy? 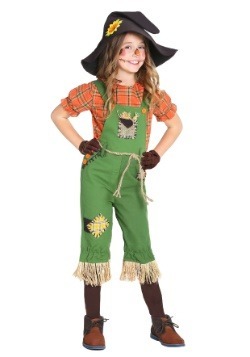 Or perhaps you're a brainiac with a penchant for ironic humor and Scarecrow is more up your alley. For us, it's the slightly exaggerated, often over-the-top idiosyncratic routines that make these characters so enjoyable. Take a peek at some of the movie's fun facts to decide which alter ego you'll take on this Halloween. It was a hard-knock farm life for Midwestern girls at the turn of the century, but Dorothy managed to look songbird sweet in a sky blue, gingham pinafore dress and puff-sleeve blouse – a common look for the time. How did she keep her endearing ensemble so clean? We're guessing that there was more singing than actual hay baling and chores going on for her at the Gale farm. Fun fact – did you know that L. Frank Baum cited the Wicked Witch of the East as donning silver slippers? MGM, not wanting to let any Technicolor go to waste, amped up the glam-factor by iconizing sparkling, ruby red slippers. 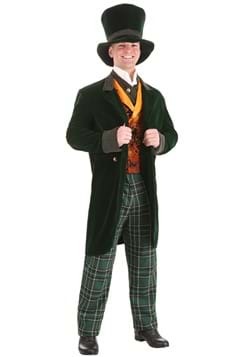 Simply click your heels together three times with a pair of our costume slippers and you'll instantly realize that there's "no place like home." Maybe she was born with them, or maybe she took just time from daydreaming about somewhere over the rainbow to curl her hair. 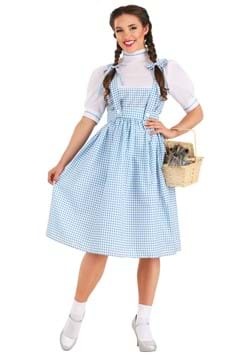 Either way, Dorothy's springy pigtails are an essential component to her character, and we have costume wigs that will recreate her brunette locks to perfection. Bonus points if you tie up your braids with matching blue satin ribbons! Some girls cite diamonds as her best friends. 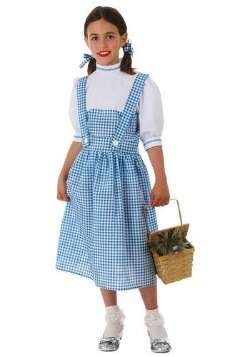 For Dorothy, it was Toto obviously! This pint-sized pooch almost stole the scene from Judy Garland's rockin' pipes when he handed her his paw during the pre-twister ballad – pretty much proving that Miss Gulch's heart was made of stone. 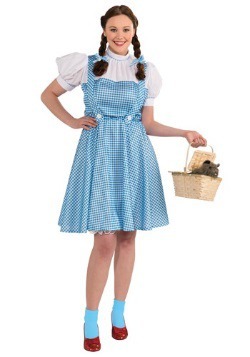 Don't forget to complete your Dorothy look with one of our stuffed Toto and basket accessories! 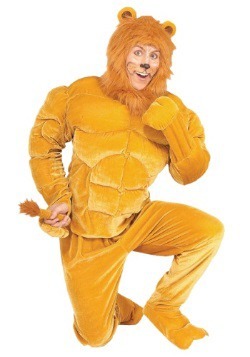 And not approved by PETA: The original lion suit was made from *gulp* REAL lion skin... and his flowing mane was comprised of human hair. Forget the glitz of the silver screen, folks. There was a lot of realism in the early days of cinema, and things weren't always pretty. 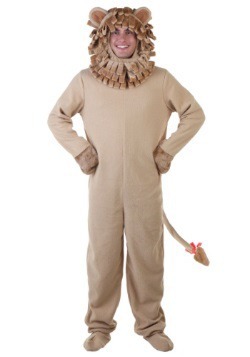 We, of course, have both Cowardly Lion costumes for children and adults, and we can assure you that no animals were harmed in their making! When you've got it, flaunt it! 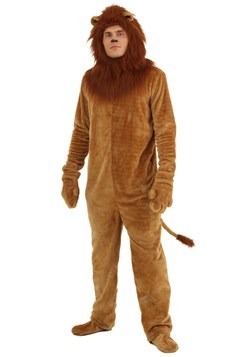 The real badge of courage should have been awarded to the lowly production assistants who were hazed/tasked with drying out that heavy lion suit each and every night. Apparently, Mr. Lahr sweat so much each day that it could almost stand on its own. 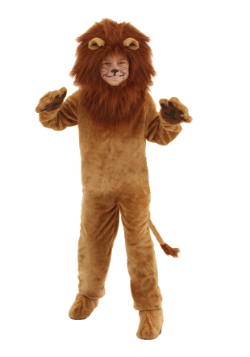 You can award yourself your own badge of courage accessory, and you won't even have to worry about drying out your authentic costume! 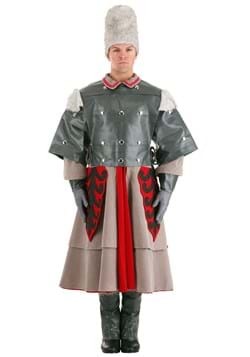 The Tin Woodsman's ensemble was inspired by mannequins of the time – they were often comprised of tin and other metals. Of course, they didn't all sport Nick Chopper's neat funnel cap, which is an absolute must-have accessory, right along with an axe and a heart. 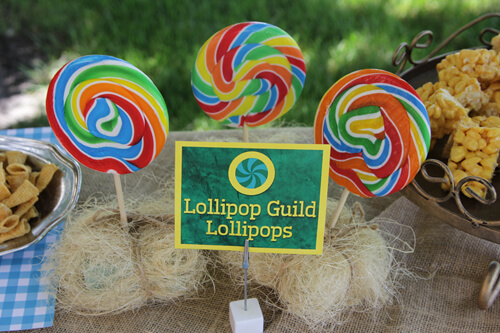 We have all of the props (made of safe and easy to use plastic!) 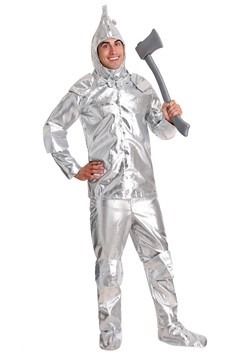 that will let you complete your Tin Man look. An allergic reaction to the metallic paint kept Buddy Ebsen from finishing the role as the Tin Man, as had to spend two weeks in the hospital dealing with respiratory issues. Jack Haley took over, but battled his own makeup demon: An eye infection (just what was in that stuff?!). 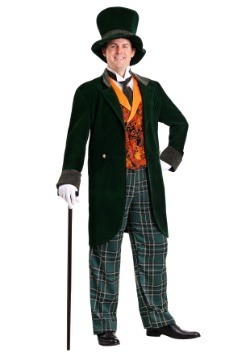 If that weren’t enough, the costume was so stiff that he couldn’t sit down between takes! To rest, he’d have to prop himself against a wall or lean against a ledge. 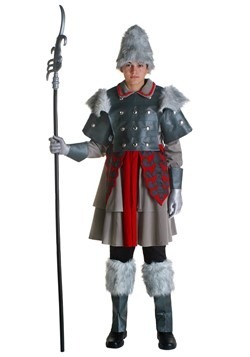 We, of course, have polyfoam costumes that will let you take on the role with a full range of motion (and the ability to sit). So just what's a prop master to do when a Tin Man's joints are fused with rust and the oil from the can isn't showing up on film? Replace it with chocolate syrup, naturally! When you're out and about, you could just pretend that there's oil in the can prop. Or you could fill it up with something a little sweeter... Just a heads up, it might be hard to justify your costume leaving a trail to the Halloween host, even if it does display spectacular "dramatic effect." 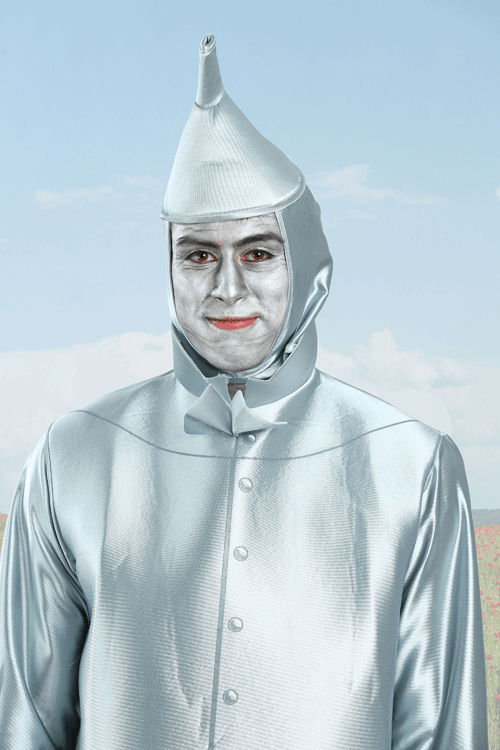 Ray Bolger was originally cast to play Tin Man, but felt that the role stifled his amazing range of capabilities (he was very limber). 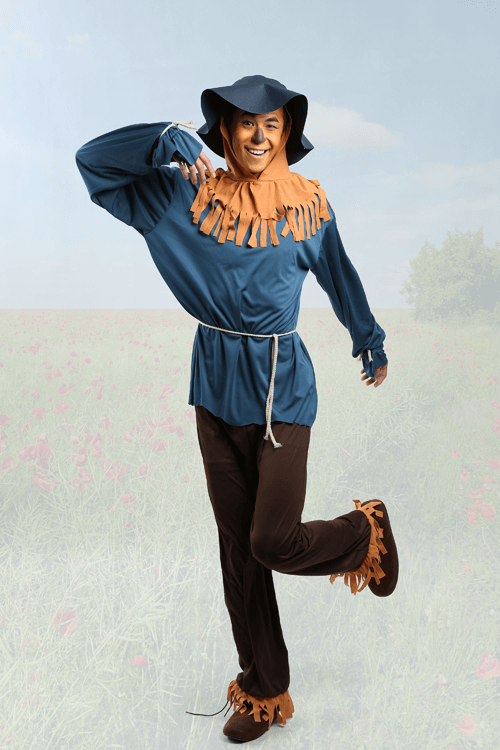 His extended song and dance number may have been shortened for the film, but after seeing the Tin Man's fate, we have to think he dodged a bullet on that one! You can't sit with us! 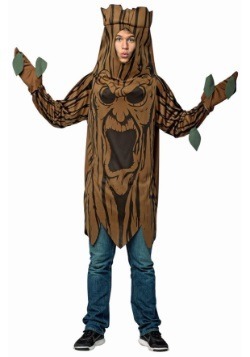 Rumor had it that Scarecrow, Tin Man, Cowardly Lion and the Wicked Witch were forced to eat lunch in their dressing rooms because the staff on the MGM lot got the jeepers creepers in their presence (nicely done, costume team). 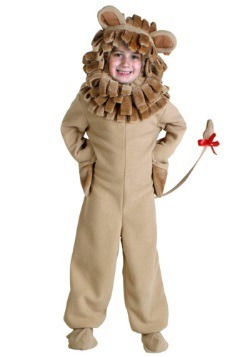 Straw trails and paint fumes and real lion pelts, oh my! 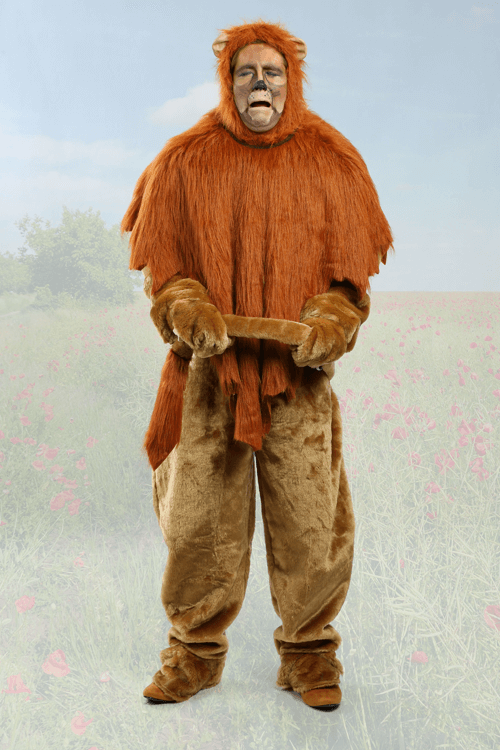 Also, when Mr. Bolger took on Scarecrow, he didn't know just how long he'd have to commit to the role. The shooting time of 6 months was plenty arduous enough, but the character's facial prosthetics left him with a pattern of deep lines that took an additional YEAR to disappear. 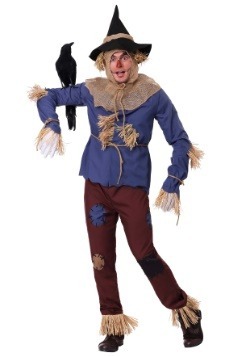 Fortunately we have makeup kits that will let you become the Scarecrow – no prosthetics required! 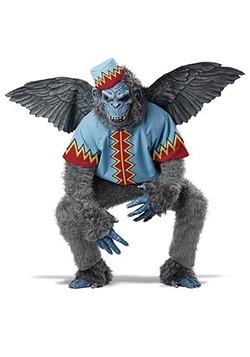 So did you know that the head flying monkey's name was Nikko? 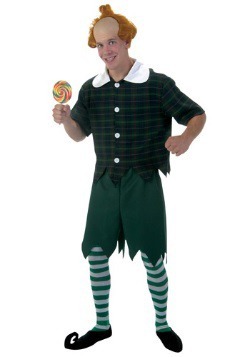 And what bugs us is just what was Nikko thinking with the uniforms in The Wizard of Oz – Memorable, yes, but a bit of a "performing monkey" cliché, no? We prefer the "motorcycle gang" re-imagining from The Wiz and the The Muppets (three cheers for magical biker caps)! 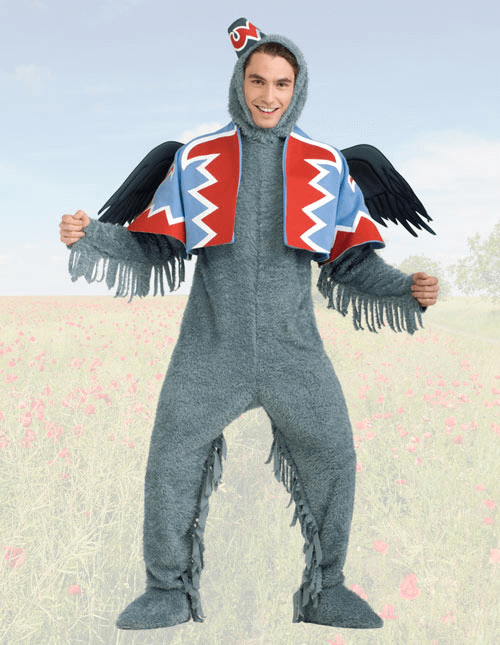 Our officially licensed Flying Monkey costume captures the original movie look, but feel free to take some liberties with your own DIY additions. Tearing apart Scarecrow, attempting to toss Toto in the river and capturing Dorothy – these monkeys were definitely under the Wicked Witch's spell and down for doing dark deeds. 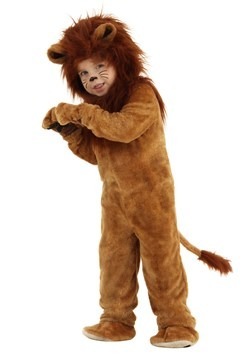 You can recreate these actions (with some creative license) by having Dorothy on your arm or walking the family dog while you're out trick or treating... but maybe save the maiming for the storybooks! 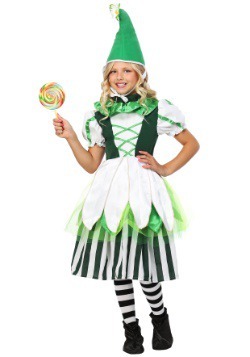 Glinda, the Good Witch from the North (who was from the south in the book) wins best-dressed AND the Miss Congeniality award, if there is such a thing in Oz. 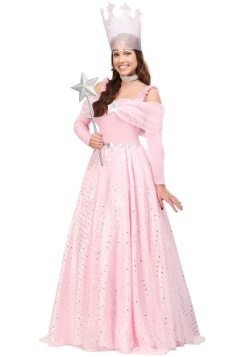 She has everything – pink, poofy layers, sparkly embellishments, a ginormous crown and a star-topped wand/staff. 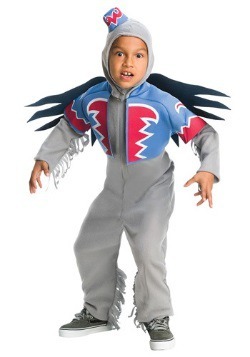 Oh, and shoulder wings. 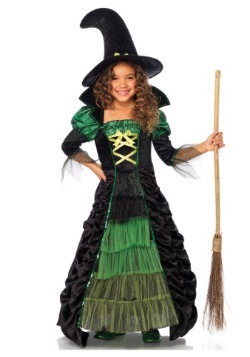 Because this witch can fly without the broom. 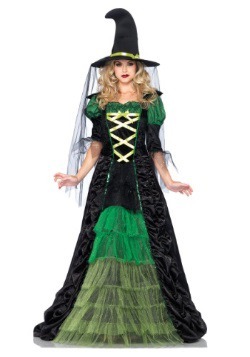 When it comes to embodying the word, "magical," Glinda really nails it! 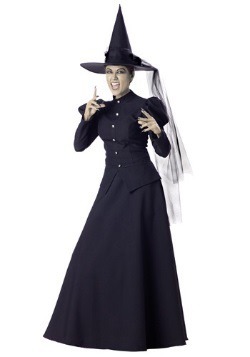 When the queen's away, the witch will play! 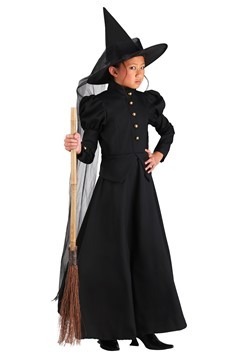 Billie Burke, the actress who played the role of Glinda in the film, made the Wicked Witch (Margaret Hamilton) green with envy over her princess-perfect dressing room. Pink and blue powder puffs and peppermints (as well as an impressive display of glamour) lured Ms. Hamilton to the off set "castle" to eat lunch whenever possible. 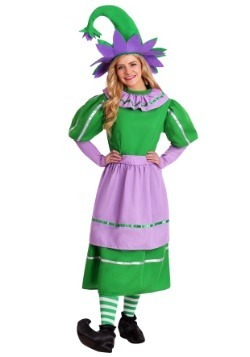 You can have a luxurious lunch or enjoy whatever kind of Halloween treats you'd like when you go in our authentic Glinda costume! 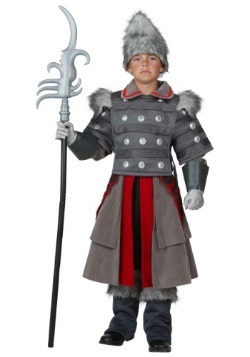 Winning a costume contest is no longer just about what you wear; it's also about how you act. A couple of choreographed group poses could be the determining factor in taking first place in the contest. Or it could be even be the key to making sure you get the most likes when you share online! We're listing the most iconic and identifiable poses from the movie, but please don't be afraid to think outside of the box. For the groups who are into obscure facts, you could belt out songs from Pink Floyd's 'Dark Side of the Moon' album, or for those who are more apt to a comedy routine you may want to get the gang into a simple, unified yoga position. 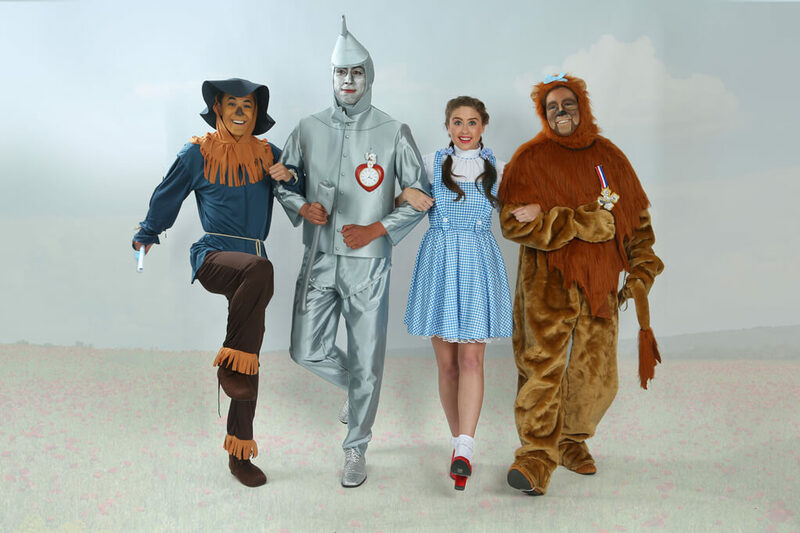 Just leave Tin Man standing up in the middle (he's not so flexible). No matter what poses you choose to do, you can guarantee you'll be Instagram-famous by checking out these timeless poses. The Follow-the-Yellow-Brick-Road-Arm-Link is a must-have in your posing arsenal. Skipping together in time is going to take some work, and Scarecrow's supple joints are enviable, but this is still THE way to enter the party together... and to make sure you'll be going up on stage to collect your prize! That Wicked Witch was scary... like so scary that half her scenes were left on the cutting room floor so that kids wouldn't have nightmares! 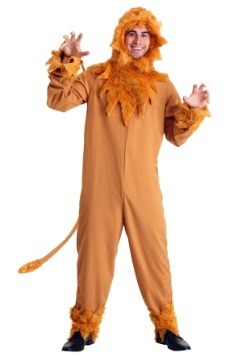 So naturally this caused Dorothy, Tin Man, Cowardly Lion and Scarecrow to huddle together in fear. 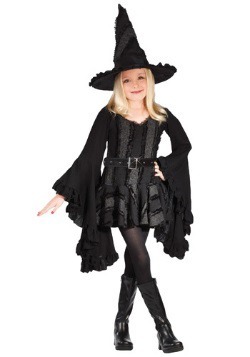 Try it on for size any time you pass a witch or warlock at the big party. The look of wonder and amazement – just like when the wizard is unveiled – will require some practice if you want it to be synchronous. Try a count of three or elect someone to point at imaginary sights to be seen. This gives everyone a focal point (which will make for an amazing photo op). 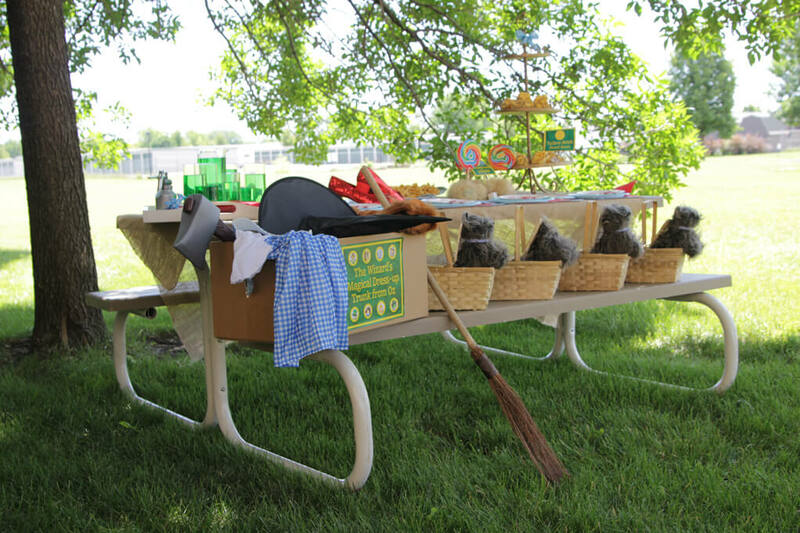 Summer means that you could host another hot-dogs-and-hamburgers-on-the-grill get together at the park... or you could follow the yellow brick road to fun with a Wizard of Oz-themed picnic party! 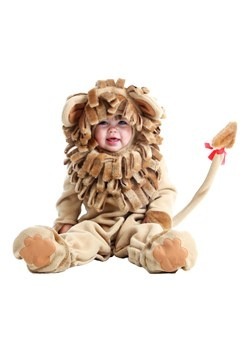 You've got the brains, heart and courage to become the host with the most, and HalloweenCostumes.com will gladly stand behind the curtain to help you infuse the celebration with touches of pure magic. 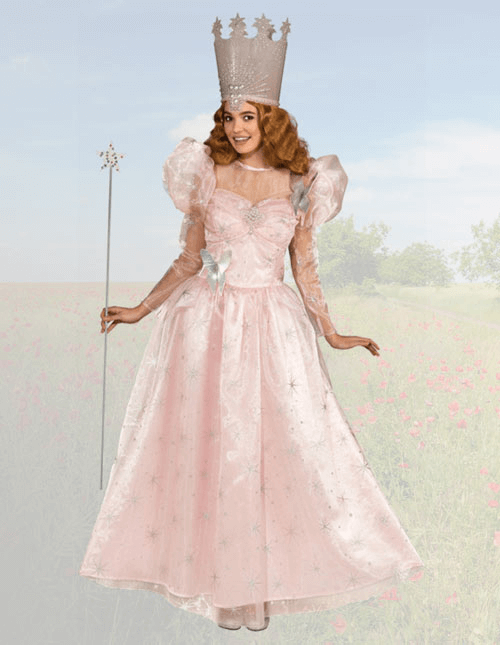 Here's Glinda's wand – simply wave it over each of the details below to create a whimsical experience of your very own. First, you'll want to set the scene. A lush, tree-filled park is the perfect backdrop to conjure Emerald City's vibe. 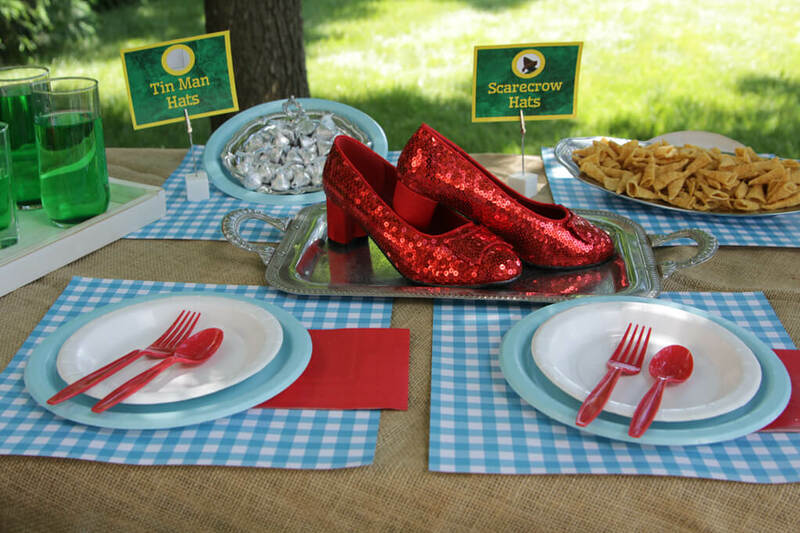 Top a picnic table with simple burlap and bring it to life with gingham-printed placemats and a ruby slippers centerpiece. Gold serving pieces will add to the dreamy table-scape. Little touches – like gingham ribbon napkin rings, a bouquet of balloons in a rainbow of colors and Toto-in-a-basket placeholder favors – will go a long way in giving your decoration dimension. In fact, let's take a moment to high-five the dads spray-painting brick pavers a yellow-gold right now. The menu isn't fussy: Emerald City punch (we mixed lemon-lime Kool-Aid with pineapple juice, but feel free to add your own touches – ginger ale for a sparkle or lime sherbet for a classic "punch" recipe), Lollipop Guild lollipops, Bugles chips (for Scarecrow hats), Yellow Brick Road cereal bars and chocolate kisses for Tin Man hats. 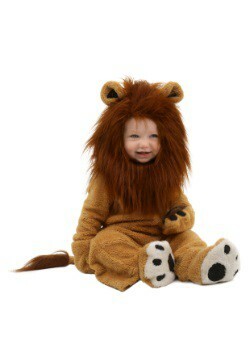 You could even do animal crackers and frosting "dip" (Lions, Tigers and Bears, Oh My!) 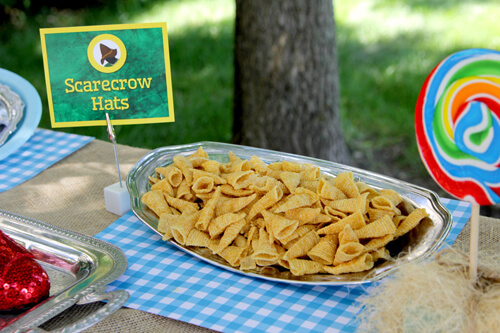 or cheddar cheese cubes (Yellow Bricks) – whichever you choose, finger foods reign supreme for a quick and easy setup/cleanup. 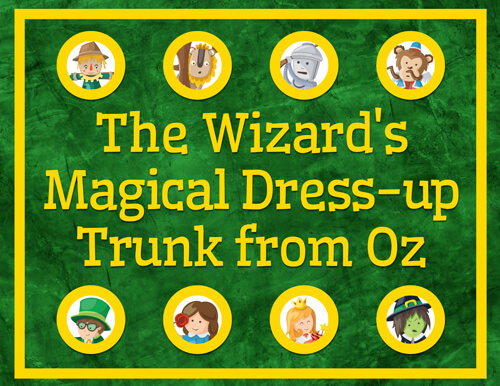 The showstopper will be the Wizard of Oz dress-up box. 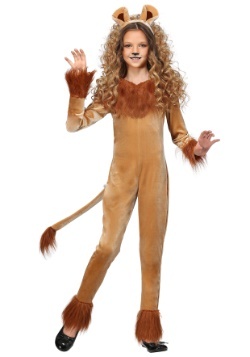 You could turn it into a fun relay race game (kids run to the end of the line, dress up as one of the characters, and then tag the next child until all of the "characters" are back over the start line), or you can just let them use their imagination – teach them the famous lines: "I'll get you my pretty, and your little dog, too! 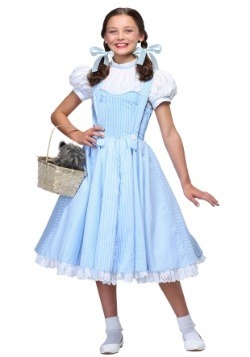 "/"Toto, I've got a feeling we're not in Kansas anymore. "/"There's no place like home." – and watch (take pictures!) as they reenact the movie or make up their own storylines. 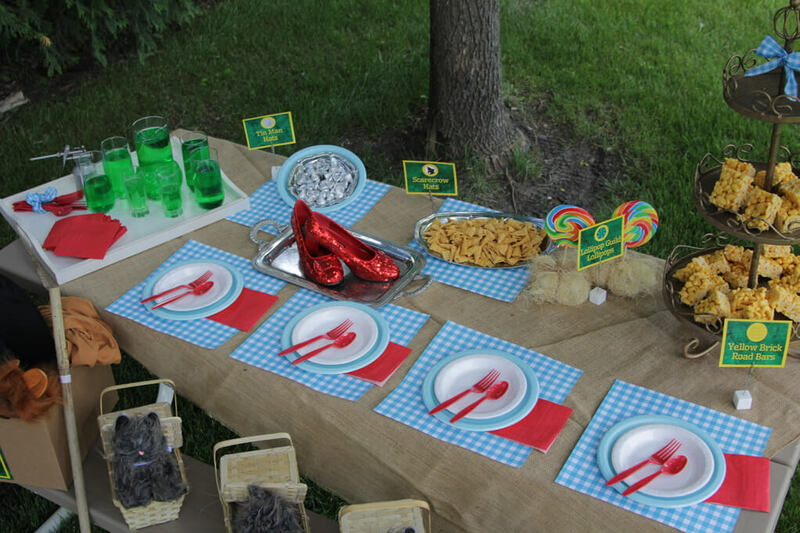 The best part of a Wizard of Oz party is that it blends with so many occasions. Make this event your own with exciting details, like a photo booth (they're in costume anyway – plus, it's a super fun thank you note add! 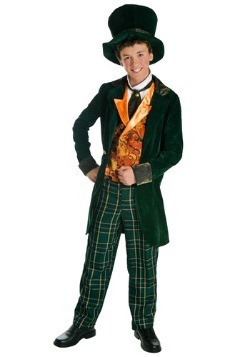 ), playing the soundtrack in the background (or the movie if you have the equipment), dressing up and reading the story, decorating UNDER your house with the Wicked Witch of the East's "legs" near the entrance, adding a broomstick race or even stuffing take-home scarecrows to the activities… the sky's the limit in the land of Oz! Do you love the polish and touch themed menu cards add to a buffet table? 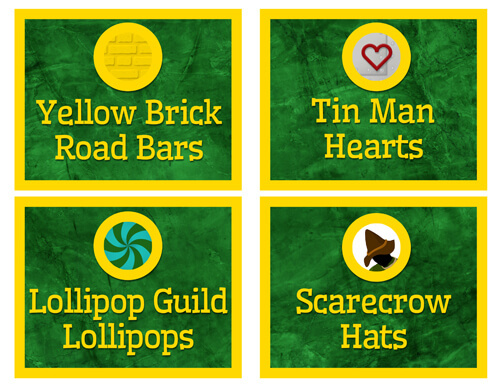 You don't have to be a graphic designer to get the look because we've created FREE printables to help you pull together all the fine details of your Wizard of Oz bash get-together. 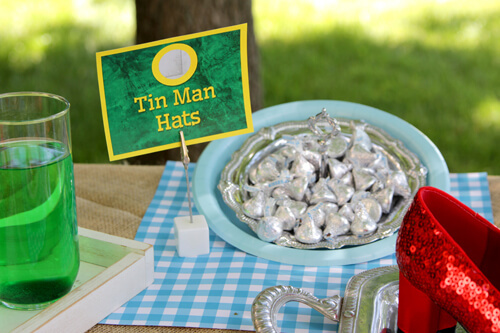 You'll find a card for "Lollipop Guild Lollipops," "Scarecrow Hats," and "Tin Man Hats" – just slip them inside any place card holder to establish your snacks as a part of the theme. 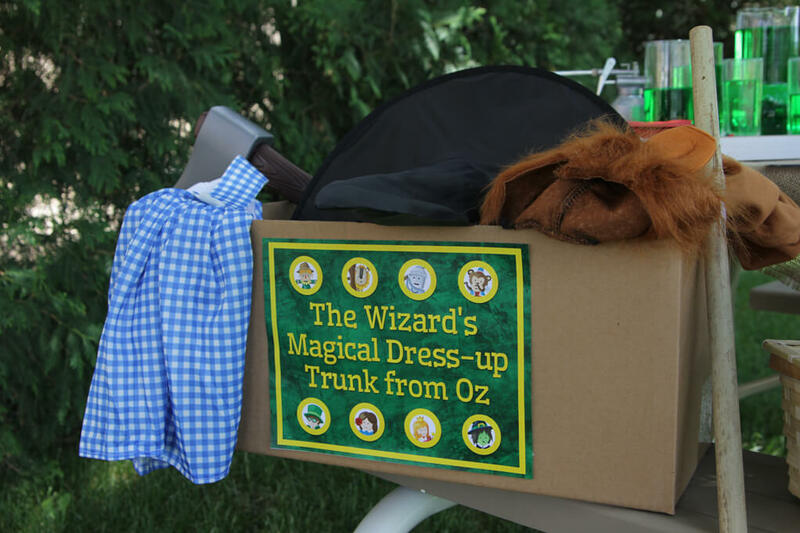 Best of all, we also feature a larger sign that reads: "The Wizard’s Magical Dress-up Trunk from Oz." 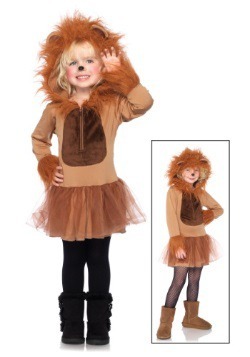 Adhere it to the side of your costume box for instant Pinterest-worthiness. 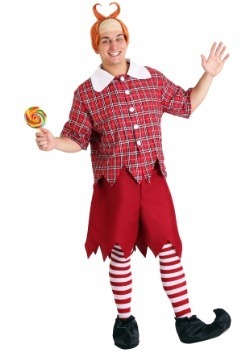 Whether you're looking to entertain children or even adults who are perpetually young at heart, we're sure your WoZ party will be one for the ages!